On the sun-drenched shores of the Riviera Maya, everyone is treated like a star from the moment of arrival at IBEROSTAR Grand Hotel Paraíso. Check in is a breeze with a fresh wet towel greeting and an iced fruity cocktail with which to ease on down the hall. The opulent charm of ancient Mayan civilization blends with modern palatial Italian décor. From the painted ceiling of the circular atrium to the marble floor, it is an art walk that makes you sigh, “Ah, time to relax and enjoy. No stress here.” And no need to go elsewhere as this is an all inclusive resort. That means exquisite food choices any time with in room service or multiple themed restaurants, all beverages including top shelf selections and activities galore, starting with of course, golf! At IBEROSTAR Playa Paraiso Golf Club, the game is surreal, set in the jungle (which itself is played as a lateral hazard). Listen to the screeches of exotic birds and watch for the spider monkey sightings on this PB Dye design which holds the PGA Tour Monday Qualifier for the Mayakoba Open. No birdies on the scorecard? Look in the jungle for red, green and gold feathers in flight. It’s a fun chase of the little white ball until the final green which is falsified on all fronts and anything less than a perfect shot may result in a back and forth sequence that rivals a debate team. 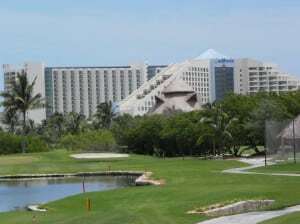 IBEROSTAR Cancun Golf Club is a completely different Yucatan experience with water on 10 of 18 holes as a reminder of the Caribbean setting . 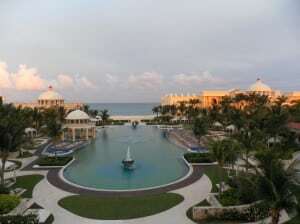 The IBEROSTAR Cancun hotel shaped like the Chichen Itza ruins looms large for an exotic feel. All food and beverage are included here as well, with tequila the cart specialty. Crocodile warnings are no joke. Given their speed of pursuit, consider that like objects in a rear view mirror, they are always closer than they seem. More benign Iguanas saunter across fairways and rule the tee boxes, observing shots. Golf packages can include both courses plus partners such as El Camaleon Golf Club, home of the Mayakoba Classic. Start your day at the breakfast buffet, unlike any other. The selection is tremendous from exotic fruits to special stations for omelets, crepes, Serrano ham; an endless variety of quality picks. Accompanying coffee, mimosas or any beverage, are delivered to the table as you enjoy the food and the view of the expansive pool, leading to the ocean. On our first morning, a Coati cartoon parade crossed the patio. These creatures are cousins to the anteater but more colorful and playful. They look like a combination of lemur, raccoon and opossum. Traveling in family packs of assorted sizes, one baby lagging behind was grabbed and carried in the mama’s mouth. Too fast to capture on camera, they were the stars of the day. 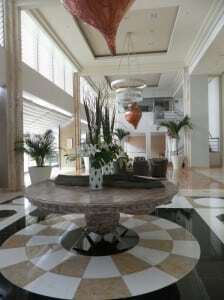 Guests may make their star appearances in the show room singing karaoke or on the Disco dance floor swinging to the salsa music, scoring low on the golf course or lying low on the beach or pool side where the “star friends” keep activities going on land and water. In five minutes we had a refresher course in scuba diving in the pool, ready to encounter the creatures of the sea. All inclusive yet very exclusive, another adventurous option is setting sail on a catamaran, catching the wind and riding the waves for a cinematic view of the turquoise sea and white sandy shore. The activities program runs the gamut from cooking and cocktail lessons to yoga, dancing, archery, air gun and so much more! The inner pool connected to the fitness center and deluxe spa guards against inclement weather and screens the decibel level of the Activities Pool with the Aqua Bar. There is no swim cocktail party inside like out, but a calm Jacuzzi, couples hydrotherapy cubby to soak in before entering the couples’ treatment room, with dim colored lights on the ceiling where kinks are massaged away. The Tranquility Pool is another option at the Grand for outdoor peace or journey to the other Iberostar locations for various water parks with wave making capabilities or a lazy river to relinquish any and all anxieties. IBEROSTAR Grand Hotel Paraíso’s sister resorts IBEROSTAR Paraíso Lindo and IBEROSTAR Paraíso Maya are in walking or shuttle distance and the IBEROSTAR Cancun Hotel is a short drive away, all with different bars, shows, and the same inclusive service. Tequila, rum, or you name it all seem to mix well in your body blender. Slip into culinary decadence with Italian, Japanese, American or Caribbean cuisine. Or keep it healthy with the lean meats, fresh produce and choosing wisely your favorite sweets. Either way indulges in peerless five-star service extended by the attentive staff, all with a genuine smile at Iberostar. The personal 24 hour butler service at the Grand is over the top, as is the artwork at every turn, marrying the Mayan and old world European culture that is the Yucatán.